Santi di Tito (December 5, 1536; July 25, 1603) was one of the most influential and leading Italian painters of the proto-Baroque style – what is sometimes referred to as "Counter-Maniera" or Counter-Mannerism. He was born in Florence, in Tuscany. There is little documentation to support the alleged training under Bronzino or Baccio Bandinelli. From 1558 to 1564, he worked in Rome on frescoes in Palazzo Salviati and the Sala Grande of the Belvedere (Homage of the People) alongside Giovanni de' Vecchi and Niccolò Circignani. He acquired a classical trait, described as Raphaelesque by S.J. Freedburg. This style contrasted with the reigning ornate Roman painterliness of Federico and Taddeo Zuccari or their Florentine equivalents: Vasari, Alessandro Allori, and Bronzino. After returning to Florence in 1564, he joined the Accademia del Disegno. He contributed two conventionally Mannerist paintings for the Duke's study and laboratory, the Studiolo of Francesco I in the Palazzo Vecchio. 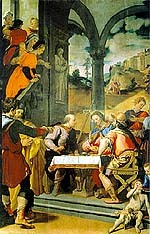 This artistic project was partly overseen by Giorgio Vasari. These paintings – the Sisters of Fetonte (Phaeton) and Hercules and Iole – like many of those in the studiolo, are stylized and overcrowded. Baldinucci recounts that Santi completely rejected the maniera of Bronzino, and embraced a classical Reformist and naturalistic style. Santi went on to contribute a Sacra Conversazione for the Ognissanti and painted two altarpieces for Santa Croce in Florence: a crowded but monumental Resurrection (1570–74), and a creatively inspired and decorous Supper at Emmaus (1574). Santi also painted a Resurrection of Lazarus for Volterra Cathedral; a Madonna for San Salvatore al Vescovo; a Burial of Christ for S. Giuseppe; a Baptism of Christ by St John for the Corsini palace, Florence. Santi died in Florence on July 23, 1603. Santi's mature style is reflected in his masterpiece of the Vision of Saint Thomas Aquinas, also known as Saint Thomas Dedicating His Works to Christ located in the church of San Marco in Florence. It expresses a simple, pious gesture that appeared to have been lost from the courtly sensibility of Italian painting since the days of Raphael, while maintaining the brittle, demarcated color that is classic of Tuscan works. The work has an earnest fervor lacking in his earlier mannerist works, which sometimes appear like a collection of posed statues overpainted with skin hues. This new contra-maniera style finds some echoes in the rising Bolognese Baroque style of the Carracci. Among his pupils were Ludovico Cigoli, the leading painter of art Reform in late sixteenth and early seventeenth century Florence. Another pupil named Francesco Mochi became a prominent sculptor in the Baroque style and created, among other pieces, the colossal Saint Veronica, in the crossing of St. Peter's Basilica in Rome." ^ "Art and Theory in Baroque Europe: From Mannerism to Baroque". sbc.edu. ^ Gauvin Alexander Bailey, Between Renaissance and Baroque: Jesuit Art in Rome, 1565-1610 (Toronto: University of Toronto, 2003), pp.28-30; ‘Santi di Tito and the Florentine Academy: Solomon Building the Temple in the Capitolo of the Accademia del Disegno (1570-71),’ Apollo CLV, 480 (February 2002): 31-39. ^ F. Baldinucci, Notizie dei professori del disegno da Cimabue in qua, (1681-1728) 2, pp. 540-544., ed. by F. Ranalli, Florence 1845-1847. ^ * Bryan, Michael (1889). Walter Armstrong & Robert Edmund Graves (ed.). Dictionary of Painters and Engravers, Biographical and Critical (Volume II: L-Z). York St. #4, Covent Garden, London; Original from Fogg Library, Digitized May 18, 2007: George Bell and Sons. p. 179. ^ Wittkower, Rudolf (1999) Art and Architecture in Italy 1600-1750 Yale Univ. Press. ^ "Santi di Tito, Le sorelle di Fetonte". thais.it. ^ "Browse Artists on artnet - Modern and Contemporary Artists". artnet.com. ^ "Collection Corse, peintures et sculptures des collections de Joseph Fesch : Musée Fesch". musee-fesch.com. Freedberg, Sydney J. (1993). "Painting in Italy, 1500-1600". Pelican History of Art. Penguin Books Ltd. pp. 620–625.